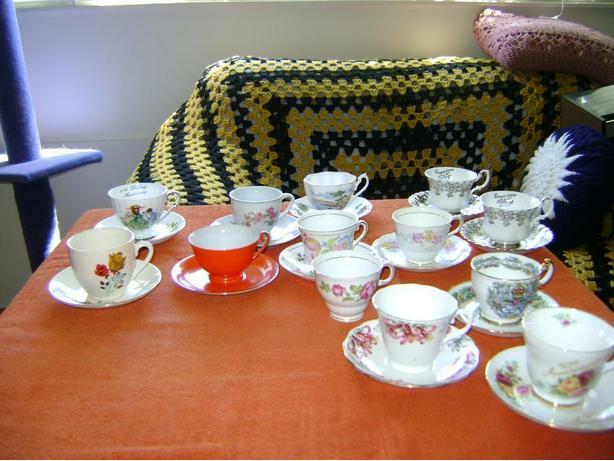 Various china tea cups and saucers. Queen Anne (tea cup & saucer), Colclough (3 teacups, 2 saucers), Rosina (tea cup & saucer), Hammersley ( Royal Coronation 1953 tea cup & saucer), Royal Albert ( Silver Anniversary 2 tea cups & saucers), Royal Grafton (tea cup & saucer), Crown Trent (tea cup & saucer), all in excellent condition. I would like to sell them all together. If interested, please call.